This being an institute of higher learning and all, I assume that you all have read the Charles Dickens classic, “A Tale of Two Cities.” Well, class, I’m here to present you a more modern masterpiece, this one entitled, “A Tale of Two Games.” It was authored on Sunday at Gillette Stadium by the Patriots and the Baltimore Ravens and boy does it make for some good reading. This one had all the trimmings – high drama, wild emotional swings, stunning reversals and surprise twists. The Pats played what felt like two entirely different, entirely separate contests, coming out slightly flat, being knocked on their collective heels, wobbling around listlessly and just generally looking lousy on both sides of the ball for the first three quarters before exploding in the fourth quarter and overtime on both offense and defense to squeeze out 13 unanswered points and beat the Ravens 23-20, improving their record to 4-1 in the process. The heroes of that first game, e.g. the first three quarters? Maybe a guy here or there. The heroes of the second game, e.g. the fourth quarter and overtime? Where do you want me to start? Tom Brady, Danny Woodhead, Alge Crumpler, Wes Welker, Zoltan Mesko, Stephen Gostkowski, quarterbacks coach Bill O’Brien, any number of a handful of defensive players (yep, you read that correctly) and of course, the returning Mr. Deion Branch, back in Foxboro after four years away, all deserve game balls. It was a sensational win, the biggest of the season by far and perhaps, the biggest of any game since the 2007 AFC Championship game victory over San Diego. And although it was decidedly modern in time and place, it bore a striking resemblance to several wins of the past, an era for which Pats fans have been longing. So with that, let’s dive into this week’s report card, and party like it’s 2003. It wasn’t perfect, not even remotely. In fact, in quarters 1, 2 and 3 it was downright dismal. The Pats looked like they missed Randy Moss. But something happened in the immediate aftermath of the 14:53 mark of the fourth quarter, following Ravens kicker Billy Cundiff’s 25-yard field goal that gave Baltimore a 20-10 lead. Suddenly, the game opened up for the offense. They went no-huddle/hurry up and O’Brien’s play calling evolved from somewhat predictable and vanilla to imaginative and complex. Fake screen passes, reverses, inside runs, play-action; they all came into play and for the first time in the game, the Ravens defense seemed off-balance and unsure of what to do. The Pats next two drives following Cundiff’s field goal were eight and 13 plays, respectively, and the end result was 10 points, a tie game and an eventual overtime win. There was a rhythm to the proceedings that was missing for the first three quarters with Brady hitting five different receivers over the final quarter and overtime. You would have thought you stepped into a time machine and Charlie Weis was still the offensive coordinator here and not in Kansas City. Of course, seeing Branch running picture perfect routes and catching a huge TD pass from Brady, you’d be forgiven if that’s what you thought. It was as clutch as it gets. Kind of like the old days. Brady through the first three quarters? 11-for-20, 136 yards, one INT, 55.4 passer rating. Brady in the fourth quarter and OT? 16-for-24, 156 yards, TD. No one benefited from O’Brien’s diversifying of the play calling more than No. 12, who spread the ball around with ease on the Pats last three scoring drives after not completing a single pass on third down prior to the fourth quarter. It seemed like Brady wasn’t able to shake off the Ravens doubling and even tripling of Welker thanks to Moss’s absence. Maybe it was because other guys weren’t getting open or there wasn’t enough production in the running the ball until later in the game. But on the fourth quarter TD drive, the running lanes opened up and that, along with a 13-yard pass interference play drawn by Rob Gronkowski, allowed Brady more time and space as well as gave him better field position with which to work. He moved nimbly in the pocket on the TD pass to Branch and was as patient as ever in going over his first couple of reads, both of which were covered. Then, on the game-tying drive, he led the team 86 yards in 13 plays over 6:50 of clock, completing seven passes in a row before finally missing on 3rd and 3 from the Baltimore 6. It wasn’t even close to Brady’s best game, as his 69.5 passer rating and 6.6 yards per attempt make clear. But he made all the throws when it mattered most in completing his 30th career fourth quarter comeback. Again, kind of like the old days. I’m no songwriter, but if I was one, my next piece would be a rootsy, americana-esque number entitled, “The Ballad of Danny Woodhead.” It’s still a bit hard to believe that he didn’t emerge from a spaceship that landed somewhere near the Red Wing down on Route 1 just hours before the Week 3 win over Buffalo, but regardless, he is as important to the team’s success over this now three game winning streak as anyone. Rudy 2 carried the ball 11 times for 63 yards (5.7 YPA) and caught five Brady passes for another 52 yards with most of the damage being done, yes, in the fourth quarter and OT. He had back-to-back runs of 14 and 12 yards on the TD drive, made a gigantic, 19-yard catch and run to put the Pats well into Baltimore territory on their final drive of regulation and throughout, made like Kevin Faulk with his blitz pickup ability (including one awesome moment in which he upended a speeding Ray Lewis). There aren’t enough superlatives to describe what Woodhead has meant to this team since he arrived four weeks ago. Elsewhere, the Law Firm produced another score, his third in as many weeks, a play that got the Pats on the board in the first quarter. Who knows what these guys’ roles will be once Fred Taylor returns from his latest injury (hopefully, they’ll stay close by since it will probably only take Taylor another game, maybe two, before he’s out again). They sure have earned the right to stay right where they are. For three quarters, all of the worst case scenario scenarios regarding Moss’s departure to Minnesota seemed more than plausible. Welker couldn’t get open in the middle of the field because there was no one outside to command a double team. Branch isn’t the deep threat Moss is. Brandon Tate wasn’t fooling anyone. But then it all opened up in the fourth. Welker had five of his seven catches from the fourth quarter on and Branch, who caught a long-ish pass early on before disappearing, exploded for seven of his nine catches and 75 of his 98 yards along with the TD over that stretch. Tate didn’t catch a pass but his 22 yard run off a reverse set up the Pats first score (the key block on that play, by the way, was thrown by Branch) and proved yet again that he can be a huge weapon even when he’s not catching the ball. Like everyone else, this group stepped up the most when it mattered most. With the game on the line, like many other times when he was still here, Moss was forgotten. Oh and Branch’s nine catches? The same number in three and a half hours as Moss in four whole games. What was to be a sure A went by the wayside when Aaron Hernandez stone-handed two seemingly easy catches late, coughing up a pair of perfect passes from Brady in overtime. Maybe it was nerves but if that was the case, he exhaled long enough to catch four balls for 61 yards, including his weekly, wide-open seam route catch and run, as well as take a perfectly timed and executed reverse and rumble for 18 yards on the opening play of a third quarter drive that would ultimately net the Pats a field goal. Gronk played a big role down the stretch, not only drawing that penalty but adding a 24-yard catch on the game-tying drive to put the Pats in field goal range. Gronk also joined Alge Crumpler in contributing to the running game with some more big blocks. The biggest block, though, came from Crumpler, who knocked a Raven helmet practically into the stands with a bone crusher on BJGE’s TD run. Much was made of Bill Belichick making Crumpler a captain for the game after the win. The way he’s played all year, virtually as another offensive lineman, is a major reason the Pats have the league’s No. 1 scoring offense and sit tied for first in the AFC East. Not this unit finest hour, with everyone but the continually astonishing Dan Connolly, who just keeps on flawlessly making Logan Mankins seem like a distant memory, having a rough moment or two. 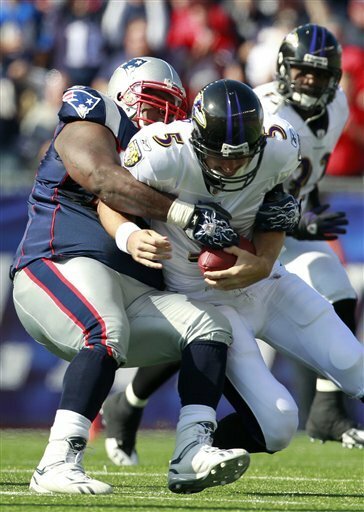 Matt Light was the biggest culprit, getting owned by Ravens motor mouth Terrell Suggs on more than one occasion and halting the game-tying drive dead in its tracks with an ill-timed holding penalty. Dan Koppen had a hard time with Baltimore’s superstar nose tackle Haloti Ngata, who had two sacks and managed to get to Brady three other times. Stephen Neal and Sebastian Vollmer both had penalties but Vollmer made up for his with a perfect seal off block on Woodhead’s 12-yard run that set up the Branch TD. More importantly than anything, the line kept Brady mostly clean after the third quarter, with a Ngata sack on the final drive of regulation the only blemish. And what was a non-existent run game in the first half opening up later on certainly has something to do with the O-line. Still, three sacks and five knockdowns on Brady is a little much. That switch flipped by the offense in the early stages of the fourth quarter? The defense – amazingly, inexplicably – did it too. Following that field goal at the 14:53 mark, the Pats defense, much maligned and rightfully so, came together beautifully, forcing the Ravens to punt on their next five possessions. Pats coverage guru Mike Reiss pointed out in his blog on ESPN Boston that they went from playing four down lineman and two linebackers on third downs/passing situations to three and three late in the third quarter and stuck with it for the remainder of the game. Coincidentally or not, that’s when the Ravens, who did whatever they wanted with their passing game to that point (Baltimore QB Joe Flacco was a horrifying 19-of-21 for 204 yards and two TDs through three quarters), began to stall out. And again, it was no names like Brandon Deadrick and Dane Fletcher combining with more heralded youngsters like Jermaine Cunningham, Brandon Spikes and Patrick Chung as well as the older guard of Jerod Mayo, Vince Wilfork and Gerard Warren, who led the way. Chung laid a huge hit on receiver Derrick Mason to break up a potential TD pass right before the Ravens final field goal and the play seemed to set a tone. There were more glaring issues in the secondary (Devin McCourty and Kyle Arrington’s inexperience, Brandon Meriweather’s ongoing complete and utter stupidity), but even that group held up when it needed to. The prevailing sentiment following the game is that the Pats defense finally showed that it’s starting to grow up. We’ll see going forward. But for a quarter-plus on Sunday, it was the best it’s been all year. Their individual lines may not completely reflect it, but the Pats defensive linemen played an terrific game on Sunday. It wasn’t enough that they held the Ravens rushing attack, led by the positively demonic Ray Rice, to just 99 yards on 34 attempts (2.9 YPA). They also got enough push on Flacco in the later stages of the game to help in keeping him from completing one sideline pass after another, which he did with complete ease through the first three quarters. And on the biggest play of the game, the stuffing of Flacco on third and inches from near midfield right after the Branch TD, it was Wilfork and Warren who got the push and made the play. Wilfork (whom CBS’s Jim Nantz seems convinced is named Wilferk) played on the end most of the day and registered six tackles, including two for negative yardage, as well as finishing off Flacco on a strip sack by Cunningham in the first half. Gerard Warren lined up on the nose and acquitted himself very solidly considering it was a new position for him. Old standby Mike Wright made a couple plays in limited time, including a sack. And Deadrick, the seventh-rounder out of Alabama, got the start and made a big impact, posting a sack to go along with a couple tackles and another hit on Flacco. In keeping with the theme, Deadrick reminded me of another not very well known, underrated lineman who once played here. His name was Anthony Pleasant and he won a ring in 2001. Say it with me – just like the old days. Holy Toledo, did these guys play well! Start with another huge, all over the place game from Mayo, who put up another whopping tackle total (18). Add in Cunningham, who made several plays on Pro Bowler/”The Blind Side,” subject Michael Oher, putting up six tackles, a sack, a couple more hurries and forcing Oher into a big holding penalty. Belichick went out of his way to praise Cunningham, slightly amazing in it’s own right. And then there’s his college teammate, Brandon Spikes who hadn’t done too much since Week 1 but he really busted out on Sunday. He had 16 tackles and was as big a factor in the Ravens inability to consistently run the ball as anyone was, regularly keeping Rice from getting enough room to bounce outside where he’s most dangerous. Rob Ninkovich, he of the huge, huge game at Miami a couple weeks ago, overcame getting dinged up a bit in the first half to put up another Vrabel-esque performance with eight tackles and a couple knockdowns of Flacco, as well nearly registering another diving INT in the third quarter on a pass that he read perfectly but just grazed his fingertips. And how could we forget Fletcher, the undrafted rookie, special teams guy out of Montana State, who came in after the third down alignment shakeup to play a spy role on Rice and the other Ravens backs and pitched in a couple tackles. Even Shawn Crable, the third year man out of Michigan whose been unable to get on the field more than a couple times over that stretch, co-authored Wright’s sack. It wasn’t quite like the days of McGinest, Bruschi, Vrabel and Phifer. But it was along those amazing lines. Well on its way to yet another big, fat F, the Pats weakest link, like everyone else, saved itself in the fourth quarter and OT. After doing carving the Pats up for three quarters, Flacco couldn’t get the ball to his receivers after that and while the pressure and scheming of the front seven was a big factor, McCourty and Arrington more than held their own after being torched again and again earlier. McCourty was especially bad, looking a lot like Darius Butler as throw after throw came at him and he couldn’t stop any of them. For good measure, he added a brutal pass interference penalty on one of the several passes that beat him. But when Flacco went back to the same pass in the fourth quarter that netted the interference, McCourty played it perfectly and broke it up. He is just a rookie and there’s a ton of pressure on his shoulders, but he is better than Butler by a mile and with all this work, he’s bound to get better, as that fourth quarter play will attest. Arrington wasn’t as bad, though on Baltimore’s second TD, he got beat by five yards, committed pass interference and still gave up the score. For the most part, though, he hung in well. Chung still has a ways to go but again, his huge hit on Mason early in the fourth seemed to set a tone and he appears to be further along than anyone else back there. And when I say anyone else, that includes Meriweather, who has two full years experience on him. Meriweather added to his ever expanding list of knuckleheaded acts with his brutal, inexcusable, woefully dumb and borderline despicable spearing of Ravens tight end Todd Heap in the second quarter. On the play, a pass to Heap was 10 yards overthrown and beyond anyone when Meriweather launched himself head first into Heap’s helmet at full speed. Belichick immediately yanked him from the game and the sight of the coach staring Meriweather down while the former first-rounder stood incredulously with his arms extended out to the sides as if to say, “who me?” spoke volumes. Sadly, James Sanders was inactive and Jarrad Page suffered an early groin injury, which meant Meriweather had to re-enter the game and shortly thereafter, he showed what he’d learned from the temporary benching by laying out Mason on the sideline after a first down catch then standing over him like Muhammad Ali. There’s a fine line between being a tough, physical, aggressive player and being a thoughtless, preening, dirty one. Meriweather doesn’t seem to know that. He doesn’t seem to know much at all. Not the tour-de-force from Miami two weeks ago, but this facet of the team continues to be one of its strongest. It starts with Gostkowski, who kicked the game-winner from 38 yards out, was 3-for-3 on field goals as he continued to put his rough start behind him, and sent a couple more kickoffs through the end zone, upping his total touchbacks on the year to 13 which is second in the league. Our man Zoltan Mesko boomed six punts for an average of 47 yards per kick which alone is outstanding. But his 65-yarder in OT with the Pats pushed back fairly deep in their own end turned the field position battle in their favor and led to the game-winning drive. It was without question the his best kick, and game, of the year. Tate only had one kick return for 19 yards but maintained his 32.6 yards per return average, also second in the league. The coverage was excellent too with the Ravens managing just 18.7 yards per return on three tries and only one punt return for -1 yard. And Welker chipped in remarkably well on the punt return team, streaking 22 yards to the Pats 47 on the Ravens final punt of regulation, giving the Pats a short field on which to embark on a potential game-winning drive. Another big day for the special teams. Hats off again to their coach, Scott O’Brien. A bit of a mixed bag here and for odd reasons. The adjustments made both offensively and defensively in the fourth quarter were tremendous and certainly could be enough to warrant a higher grade here. But there were some problems with clock management at big moments and that sort of thing falls right at the feet of the head coach. Both at the end of the first half and the end of regulation, the Pats, armed with multiple timeouts, let precious seconds elapse before stopping the clock – following a four yard completion on third and 9 in Baltimore territory at the end of the second quarter and burning nine seconds before calling time in the process, and after a sack on the final drive of the fourth, letting the clock run from 26 to 15 seconds before making the call. On both occasions, these brain freezes cost them at least one play, maybe more. Of the fourth quarter mishap, an extra play could have meant the difference between a potential game-winning field goal attempt and OT, which of course could have gone a lot differently. Obviously, the win made these gaffes much easier to stomach. But it wasn’t the first time this season that mismanagement of the clock proved to be an issue. Belichick is not Andy Reid or Herm Edwards or Brad Childress, all of whom are or were notorious for routinely botching clock management. He and his staff deserve a ton of credit for overseeing the comeback on Sunday. But there was most definitely a little luck involved and there didn’t need to be. I thought people liked Ali’s theatricality…just not on a football field I guess. Plays as big as the state of Alaska. Fibbed when he said he was 5-foot-nine…. Jeremy: we’ll get this ballad done soon. I would have given Quarterbacks a B+. Why you ask? You automatically get an extra point for getting in a guys face that outweighs you by 75 pounds. Brady was like a Ken doll in “Childs Play”. Loved seeing him fired up. The DB’s still worry this man. Im not sure they upped their game in the second half or Joe Flacco continues to chomp logs. When Zoltan boomed that OT meteor, I woke children in neighboring houses with my screaming of his fortune teller name. You would have been proud Jeremy. Team Zoltan for life. For someone who has watched Danny Woodhead, since he was a Freshman at Chadron State College, in Western Nebraska, I have to just say, “I TOLD YOU SO!!!!!!!”. Danny has shown this spark since he went to North Platte High School. The best is still to come, if the coaches will just give him a fighting chance. If the Patriots relegate him to a backup, they are wasting a potentially great player. He has found himself a home with a good group of athletes. And, I also loved when Tom got in that guys face, totally BADASS!!! Well written as usual, what a freaking game!! I wish the Pats could afford to cut Meriweather. He’s simply awful, undisciplined, and immature. Maybe he’ll wise up after Rodney Harrison had his 45th man to man talk with him.